This photo is a scan, of a xerox, of a photo of Christoph Goetz (Gotz), born 1809, Nuremburg, Bavaria, Germany, who was the father of John Charles Marcus Gates (born Goetz). John Charles Marcus Gates was born in Nuremburg, Germany in 1845 and immigrated in 1864, age 19, ending up in Louisville, KY. He was father of 8 children, including A.J. Gates, Albert Gates and Mabel Gates. The story from my Nana (A.J. Gates' wife) was that Christoph Goetz told his wife, Anna Sibylla (Steffler) Goetz, that he was going to war and might not be back. If this photo is Christoph, it must have been taken shortly before he left. Not sure which war. There was a revolution in Germany in 1848. Not sure if this revolution continued up to 1857, the year of his death, in Nuremburg, or if he was injured and died later. With a uniform, one might think that he was in a German army, part of the government, that was trying to suppress the revolting 48-ers. Some detective work on the uniform might exactly date which army he was with. In 1853, four years before his death and a few years after the revolution of 1848, considered by most to have failed, his oldest son, Lawrence, was sent to America, at age 14, where he worked on a farm in Indiana. 1854 was the last year we know Christoph was with his family, since he conceived his last child, a son, who was born Dec.1854 in Nuremburg. Being that the father was going to war around the same time that the sons were leaving for America might lead one to suspect that they might have been removing their sons to avoid their having to join the German army when they reached the age of conscription. 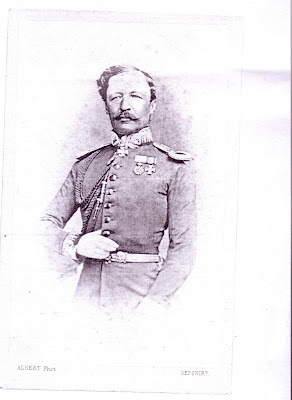 Seven years after Christoph died, his second son, John Charles Marcus Goetz, immigrated to America in 1864, at age 19, to be followed by Christoph's third son, Christopher Lawrence, who immigrated, the following year, in 1865, at age 17. The rest of their family, two sisters, Christina Barbara Goetz and her husband George Weiss; Margaret Goetz and her husband George Fiedler, their mother, Anna Sibilla (Steffler) Goetz and youngest brother, William J.C., followed in 1867.
Who do you think he looks like? I think he looks like my Uncle Gussy (My mother's brother, son of A.J. Gates). How appropriate that we now have another ancestor face to go with the newly-determined Gates DNA haplogroup of R1b1a2! Thank you, cousins in Indiana, for sharing this image with us. Another photo below from our Indiana cousins. 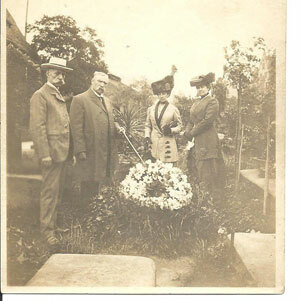 This is John Charles Marcus Gates, wife Elizabeth (La Salle) and daughter Gertrude Gates Vogel at the grave of Christoph Goetz. Apparently Christoph did come back from the war alive. Caption on back says: "Our father's grave, Christoph Gotz, born Nov 17, 1809, died Oct 30, 1857." From left: unidentified man (possibly John Charles Marcus Gates' German cousin, "Karl"? ), John Charles Marcus Gates with the cane, Gertrude Gates Vogel, his oldest daughter (Gertrude was A.J. 's, Mabel's and Albert's older sister) and Elizabeth Lasalle Gates, his wife. This photo below is from Connie Gates Markle's collection. She thought the man in the portrait frame might have been Christoph Goetz. 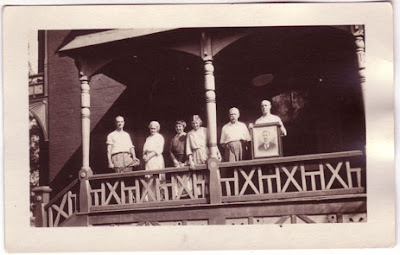 From left: Albert Gates, Elizabeth Gates, Mabel and Gertrude Gates (or Mabel and friend), John Charles Marcus Gates, and Charles Gates, holding portrait of unknown ancestor, possibly Christoph Goetz. If only they had kept a diary, we might not have to wonder and guess what their reasons for their actions were. Yet, do any of us moderns consider keeping a diary to record the reasons surrounding our current life events?